Headquartered in Milwaukee for over a century, the Briggs and Stratton Corporation began in 1908 as a partnership between inventor Stephen F. Briggs and investor Harold M. Stratton. The company initially focused on manufacturing automobile parts such as locks, igniters, and starter switches, the last of which accounted for most of the company’s business as the automobile’s popularity soared in the early decades of the twentieth century. 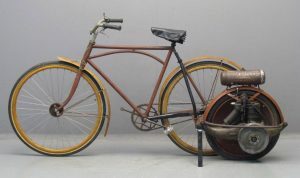 In 1919 Briggs & Stratton acquired the A.O. Smith Motor Wheel, a small engine that would drive research and development toward the four-cycle gasoline engine. These engines were later installed in washing machines, garden tractors, cultivators, and gas-powered generators. 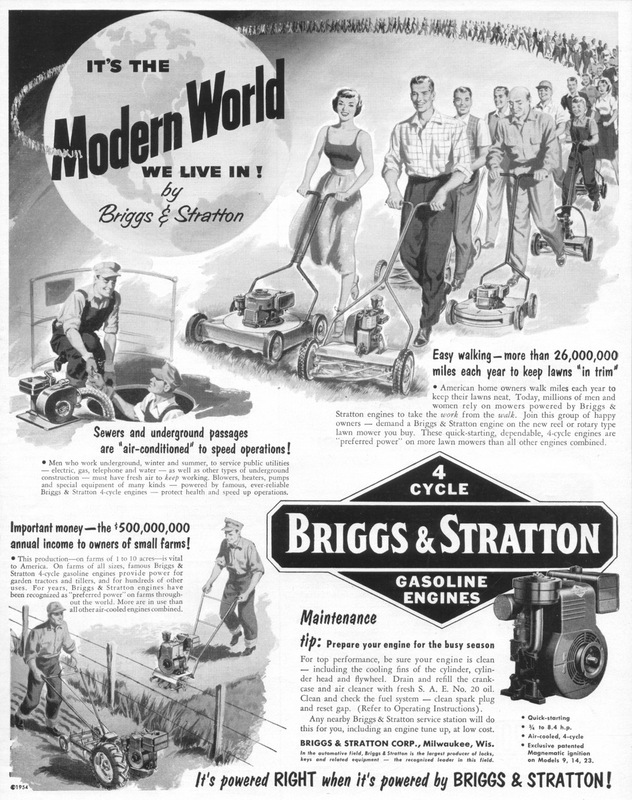 As the demand for gas engines grew, Briggs & Stratton developed new models for different purposes. The company’s engines were manufactured for personal use, agriculture, and military logistics. During the Second World War, the United States military used Briggs & Stratton engines to power generators on the front lines, and integrated the company’s ignition systems into planes for the Air Force. The company thrived under the leadership of Charles Coughlin, who served as its president from 1935 until 1972. During Coughlin’s tenure, Briggs & Stratton revolutionized the lawn and garden industry by producing the first lightweight aluminum engine. As suburbanization grew after World War II, demand for home and garden equipment exploded. The aluminum engine accounted for nearly 80% of all Briggs & Stratton product orders in 1957. The company had become one of the country’s leading producers of small engines by the 1970s. In 1981, its success landed the company on a Fortune 500 list that ranked Briggs & Stratton Corporation number 382 out of America’s 500 most profitable companies. But the oil crisis of the late 1970s, combined with concern for the environment and small engine competition from Japanese businesses, prompted major investment in engine research and development. The company experimented with gas-electronic motors and created Vanguard, a new line of industrial/commercial products. It also aggressively pursued international markets by allying with the Daihatsu Motor Company and Mitsubishi Heavy Industries. Briggs & Stratton expanded their brand by creating the Motorsports Division in the 1990s, producing engine parts, racing gear, and the most racing engines by any one company in the world. As of 2011 Briggs & Stratton employed over 3,000 people across the United States, producing more than nine million small engines every year. Over 16,000 dealers and retailers stocked and sold Briggs & Stratton products throughout the country and internationally. ^ “Our History,” Briggs and Stratton Corporation website, accessed April 4, 2016. ^ Jeffrey L. Rodengen, The Legend of Briggs & Stratton (Fort Lauderdale, FL: Write Stuff Syndicate, 1995), 31-32. ^ “The History of Briggs & Stratton,” Briggs and Stratton Corporation website, accessed April 4, 2016. ^ John Gurda, The Making of Milwaukee (Milwaukee: Milwaukee County Historical Society, 1999), 308. ^ Rodengen, Legend of Briggs & Stratton, 99-100; “The History of Briggs & Stratton,” accessed April 4, 2016. ^ “Providing Power and Service (1920-1960),” in “Our History,” Briggs and Stratton Corporation website, accessed April 4, 2016. ^ Harry H. Anderson and Frederick I. Olson, Milwaukee: At the Gathering of Waters (Milwaukee: Milwaukee County Historical Society, 1981), 156. ^ “The History of Briggs & Stratton,” 6, accessed April 4, 2016. ^ “The History of Briggs & Stratton,” 6-7, accessed April 4, 2016. ^ “Briggs & Stratton: An American Brand,” Briggs and Stratton Corporation website, accessed April 4, 2016. Anderson, Harry H. and Frederick I. Olson. Milwaukee: At the Gathering of Waters. Milwaukee: Milwaukee County Historical Society, 1981. Gurda, John. The Making of Milwaukee. Milwaukee: Milwaukee County Historical Society, 1999. Rodengen, Jeffrey L. The Legend of Briggs & Stratton. Fort Lauderdale: Write Stuff Syndicate, 1995.